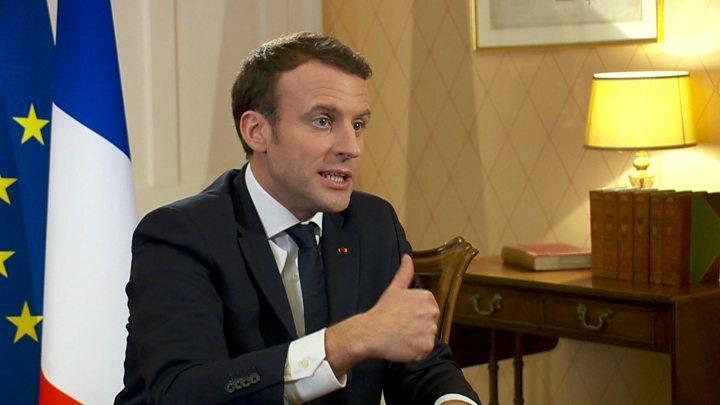 Media captionPresident Macron: "You can't have full access to the single market if you don't tick the box"
French President Emmanuel Macron has suggested the UK could get a special trade deal with the EU after Brexit. But he warned that Britain would not have full access to the single market without accepting its rules. Speaking to Andrew Marr, he warned - as Brussels has already done - that the UK could not "cherry-pick" the elements it liked. A deal might fall somewhere between the single market and a trade agreement, he said. Mr Macron's comments came during his first visit to the UK since becoming French president, where he held talks with Prime Minister Theresa May. In the interview, to be broadcast on Sunday, the leader said the UK should not gain access to the single market without accepting its "preconditions", which include freedom of movement across the EU, budget contributions and the jurisdiction of the European Court of Justice. "There should be no cherry-picking in the single market because that's a dismantling of the single market," he said. "As soon as you decide not to join the [EU] preconditions, it's not a full access. "What is important is to not make people believe that it is possible to [have your cake and eat it]." He said the UK could have "deeper relations" with the EU than other countries, as with Norway, but ruled out full single market access as "you decided to leave". Speaking in a separate interview, with German newspaper Bild, Mrs May insisted any new deal between the UK and the EU was "not about cherry-picking". "We want to negotiate a comprehensive free trade agreement and a security partnership," she said. "Because we don't start from the position of, say, Canada or Norway - there are significant and long-grown economic links between us. "What I want and hope is that the importance of a lasting good relationship for people on both sides of the Channel is recognised." Essentially President Macron is looking for a negotiated Brexit deal that is in France's interest. And this is what the British government is hoping: that each EU country will now push its own agenda in trade talks, allowing the UK to get the bespoke deal it wants. But the cold water on that argument is that every EU member benefits from the European single market. They don't want rules to be broken just for the UK if that might hurt them in the long run. President Macron believes EU interests are France's interests. He aims to "make France great again" and wants his country to be the most influential in Europe (taking from Germany, which is now hobbled by domestic political problems). He won't endanger his grand plan by advocating special deals for the UK that might damage the EU as a whole. Mr Macron said access to the EU for the UK's financial services sector was "not feasible" if the UK did not accept the obligations of the single market. But he insisted he did not want to "unplug" the City from the EU, adding: "It doesn't make sense, because it's part of the whole financing of our European Union." He told Marr it was not too late for the UK to change its mind about remaining - describing the 2016 referendum as a "mistake". "I do respect this vote, I do regret this vote, and I would love to welcome you again," he said. "It's a mistake when you just ask 'yes' or 'no' when you don't ask people how to improve the situation and explain how to improve it." Mr Macron said he believed the Brexit vote mainly came from the middle and working classes, and older people, who "decided that the recent decade was not in their favour". "When I look at your debate it was too much favourable just for the City and less favourable for the rest of the country," he said. But, speaking to Bild, Mrs May once again flatly denied there would be a second referendum: "Parliament gave the British public the choice and they made their decision. I think it's important that politicians then deliver on that." On his first visit to the UK this week, President Macron signed a treaty with the Prime Minister to speed up the processing of migrants in Calais. She said both leaders remained committed to the Le Touquet border agreement which established French border controls in Britain and UK controls in Calais. The UK also announced an extra £44.5m to be spent on beefing up Channel border security. The visit was punctuated by a smiling selfie taken of Mr Macron and Mrs May, at an evening reception in the Victoria and Albert Museum. 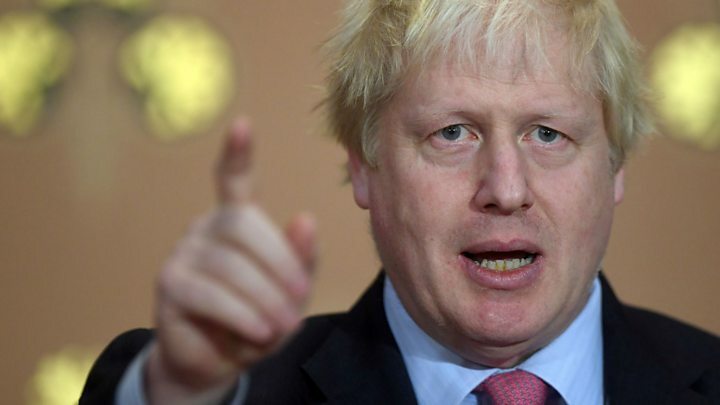 During the trip there was chatter about whether UK Foreign Secretary Boris Johnson had discussed building a bridge across the English Channel, between France and the UK. But Downing Street has said there are "no specific plans" for such a project. Media captionBridge designer Ian Firth and engineering expert Dave Parker on whether a bridge is feasible. The full interview with French President Emmanuel Macron will be broadcast on The Andrew Marr Show on Sunday at 09:00 GMT. You can watch it on BBC iPlayer after it is broadcast.